Cummins diesel motors deliver steady and smooth operation at any speed; there are two Kohler generators to deliver plenty of power to run all of the appliances and creature comforts This boat has all option available on this model including Raytheon Joystick Steering and Twin Disc EC-100 engine syncs Has all the dockside connections needed, Intercom cable T V/Phone, Video Cam for engine and Aft w/monitor, Built in vacuum, Dinghy w/cradle and lift, 1999 Novurania 11'-11" with a Honda 40 four stroke. Cummins Diamond Series 4508 that were just rebuilt and only 90 hrs. since rebuild and 1850 hours of total use on the boat. Recent upgrades-Jan 2016 New windshield screens New forward Sun pad with cover Just detailed inside and out August-2016: New exhaust for both engines and generators New a/c lines Two new a/c units Interior renovations in the salon and galley area, new flooring, wall paint. October-2016: New Bimini enclosure Included: Dinghy: 1999 Novurania - Honda 40 - 4-stroke INFORMATION ON CONDITION This Carver Pilot 530 is in good shape and has been well maintained by her owner, serviced by trained mechanics, recent survey and records are available with offer.All systems are operating as they should according to the owner, both engines, both generators and all a/c's are in good working order. 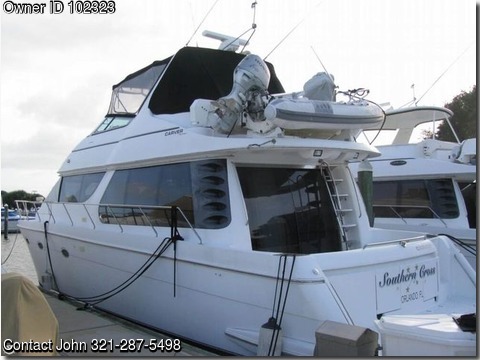 The owner is very motivated and has her priced the lowest on the market at this time.